Folks in Oklahoma could be staring at a lot more guns on Nov. 1. Folks in Oklahoma could be staring at a lot more guns on Thursday. That’s when a new state law goes into effect allowing gun permit-holders to carry their weapons out in the open, according to the Tulsa World. 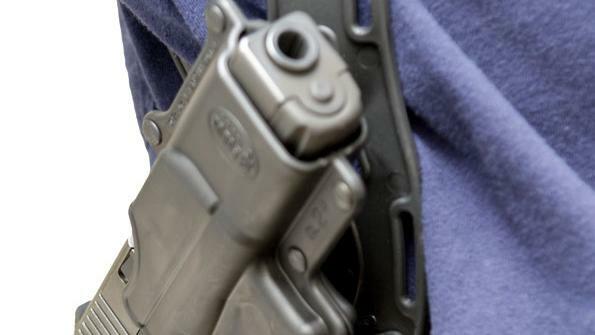 Oklahoma becomes the 44th state to allow some form of “open carry” for gun owners. In Oklahoma, the new law affects more than 140,000 residents — about 3 percent of the population — who already have concealed-carry permits for their handguns. Now, if they choose to, they no longer have to conceal those weapons. It’s unclear what effect the new law may have. Law enforcement officials expect an uptick in nervous people calling 911 to report someone with a gun, but experience from other open-carry states does not indicate an increase in shootings or threats to the public. Gun control organizations say carrying guns in public is “inherently threatening and intimidating,” according to the Brady Campaign. Gun rights advocates say that concern is overblown, and that most gun owners choose not to carry their weapons in the open even in open-carry states. The new law could present challenges for Oklahoma law enforcement officers responding to calls about a person with a gun. In Minnesota, which enacted open carry in 2003, officials added training for officers and dispatchers dealing with such calls.